Everett Ruess was not the first human being to vanish in the grim desert wilderness—nor is it likely he will be the last. But because of the unusual character of this young man and the strange circumstances of his disappearance, there still remains after four years of fruitless search a widespread interest in this desert mystery. The accompanying picture of Everett was taken two years before his disappearance. The dog. Curly, was his companion on many trips. "Say that I kept My Dream"
WHEREVER poets, adventurers and wanderers of the Southwest gather, the story of Everett Ruess will be told. His name, like woodsmoke, conjures far horizons. Everett left Kayenta, Arizona, November 11, 1934, to write, paint and explore among a group of ancient Indian cliff dwellings. His last letter to his parents in Los Angeles explained that he would be unable to communicate for ten weeks. Alone with his paints, books and two burros, he disappeared into what is probably the most uninhabited, unvisited section of the United States. A sheepherder reported seeing him on November 19 near where Escalante Creek flows into the Colorado. At the first alarm of his prolonged absence, volunteers organized searching parties, combed the hills and canyons for days. Signal fires were built, guns fired. Indians and scouts sought water holes for signs of his passing. In Davis Canyon Everett's two burros were located, contentedly grazing as if he had just left them expecting shortly to return. Then, one after another, the searching parties returned without Everett. True to his camping creed, "When I go, I leave no trace," he disappeared—into thin air. The desert claimed Everett Ruess. Writer, adventurer and artist, the desert's trails were his roads to romance. His paintings captured the black-shadowed desolation of cliff dwellings. His poetry told of wind and cliff ledge. He sang of the wasteland's moods. Everett belonged to the desert. And in the end, it claimed him. He was one of the earth's oddlings—one of the wandering few who deny restraint and scorn inhibition. His life was a quest for the new and the fresh. Beauty was a dream. He pursued his dream into desert solitudes—there with the singing wind to chant his final song. Everett's quest began early—and ended early. As a child he turned from toys to explore color and rhyme. Woodcarving, claymodeling and sketching occupied his formative years in New York and near Chicago. From this early background grew his versatility in the arts—media through which he later interpreted the multihued desert. At 12 Everett found his element—writing. He wrote inquiring essays, haunting verse; he began a literary diary. The diary matured into travel-worn, adventure-laden tomes. Wind and rain added marks to the penciled pages, scrawled by the light of many campfires. At 15 Everett was a member of Mrs. Snow Longley Housh's 1929 creative poetry class at the Los Angeles High School. An earlier spur to verse writing occurred with his winning Mrs. Marguerite Ball Dickson's book, "Tumbleweeds" as an award for his Indian poem, "The Relic," written while a student at Valparaiso High School, Indiana. The silence of wilderness nights during his desert vagabondage was broken by his chant of remembered songs—poems that (in his diaries) he stated lifted his spirits and renewed his courage. Even in early years the wild called Everett. The ocean's restlessness matched his own; mountains lured him; the desert fascinated him. His poems were of space, wind, sand, and sage. "One night, long ago, while I tossed restlessly upon my bed, an idea crystallized within me . . . My brain was busied with tense imaginings . . . In my mind I conjured up a thousand forgotten cities, left behind by the years; sheer grey mountains; mile upon mile of bare, unfriendly desert; cold lakes . . . jungles filled with deadly snakes, immense butterflies, brilliant colors, fever and death. I swam in coral-tinted waters. Through insufferable heat and incessant downpours I plodded forward. "On bleak, windswept coasts . . . I pitched my camps. On the banks of the sluggish Amazon I built my fires . . I tramped alone through wildernesses . . . On storm-lashed islands I stood, surveying far-off mountain peaks. Then I camped beneath them in shadowed valleys, watching the sunset . . . These are the things I saw and the experiences I lived through that night long past. Now it is night again—the night before I go. Once more I think of that which lies ahead. "Bitter pain is in store for me, but I shall bear it. Beauty beyond all power to convey shall be mine . . . Death may await me . . . Not through cynicism and ennui will I be easy prey. And regardless of all that may befall, let me not be found to lack an understanding of the inscrutable humor of it all." That was Everett's farewell to boyhood and home. Somewhere your spirit lives where kindred spirits are. Through canyons dark and steep and treacherous have trod. An Indian hogan sheltered you at close of day. To watch the mystery of stars and vibrant dawn. Remembered melodies, and chanted poetry. Everett's last letter to his brother, Waldo, said, " . . . as to when I revisit civilization, it will not be soon- I have not tired of the wilderness . . . I prefer the saddle to the street car, and the star-sprinkled sky to the roof, the obscure and difficult leading into the unknown . . . It is enough that I am surrounded with beauty . . . This has been a full, rich year. I have left no strange or delightful thing undone that I wanted to do." In Arizona he rode broncos, branded calves and explored cliff dwellings, where as he wrote, "The dim and silent centuries invade." In 1934 he worked with University of California archeologists excavating near Kayenta. He was the only white man to be painted that year by the Hopis for their traditional Antelope Dance. He spoke Navajo and sang Indian songs. Once with a painted brave he chanted prayer-songs at the bedside of a sick Indian girl. As he traveled he sold or traded blockprints and watercolors. He endured stoically—like a good Indian—the hardships of his lonely life. Among the earth's wastelands he found nepenthe for what he termed "an undercurrent of restlessness and wild longing." He often said, "I too, long for that inner stillness, but I have yet more of the wild songs of youth to sing." Alone in an immensity of drifting sand and fingerlike peaks, Everett forgot the passage of time. He forgot that civilization awaited his return. Everett forgot all but the mystery laden voice of the wind, promising to reveal to him the secrecies of distance. Here was the beauty he sought. He absorbed the mauve and pastel splendor, climbed cliffs, explored, forgetting to return . . . So far as is known, Everett did not live to see his 21st birthday, March 28, 1935. Numerous theories fail to explain his disappearance. Only the wind to which he was pledged (at 15 he wrote the poem, "I Have Given the Wind My Pledge,") knows the answer to the riddle. silence he will live on creatively. whose life songs break after a stanza. And so to Everett. He kept his dream! Since the foregoing story of Everett Ruess was written, the Desert Magazine has received the following letter from the author, Hugh Lacy, throwing some additional light on the strange disappearance of the Ruess boy. Several new clues have come to light since my story about Everett Ruess was written. A San Francisco feature writer, who covered the search for Everett for United Press, is now gathering more information and is hot on the case, hoping to solve the mystery. Several interested persons in recent correspondence with the Ruess family brought to light that there are two Wilson's mesas. 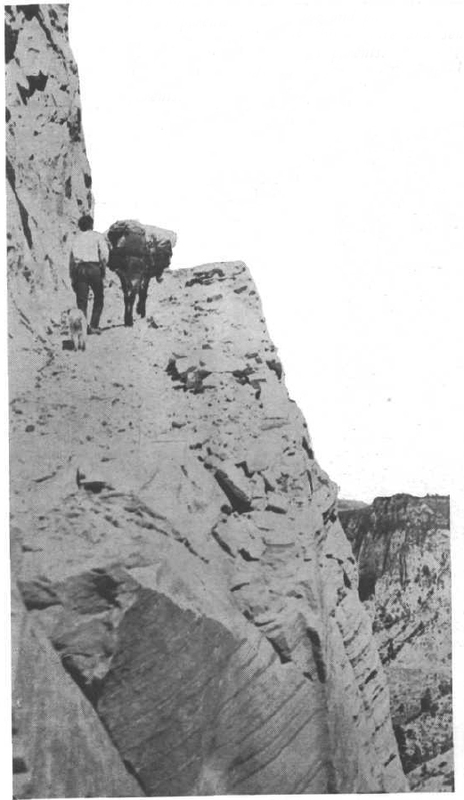 Wilson's mesa was one of the points Everett intended taking in on the trip during which he was lost. Only one Wilson's mesa was searched. As a result, interest in the search has been renewed, although at present the parents have not had sufficient time to authenticate the existence of another Wilson's mesa. I checked maps with several Los Angeles librarians and could find only one. Then I called a Los Angeles geologist who has explored that area and he assured me there are two. The second, he said, according to the U. S. Geological Survey index, is near La Salle mountain. Another searching expedition may be organized. Also, reports from different sources have recently reached the parents of three different youths seen in the desert, any one of whom may have been young Ruess. One woman identified a picture of him as a boy she had seen last year. I would like to suggest that anyone possessing information in any way pertinent to the case write to me at 141 Milna Avenue, Whittier, California. A friendly hiker who met Everett with his dog and pack burro on the trail took this picture and sent :t to the boy's parents.